When somebody asks me if I want to get sauced, they don’t have to ask me twice! And so it is for this Sunday’s installment of #SundaySupper. It all about the sauce! My recipe for Garlic Mushrooms In Red Wine Sauce is certainly at the top of my list for delicious sauces, and it takes a steak to a whole other level. I found this recipe from Whole Foods Market and have adapted it with additional herbs and aromatics. The result is a deep, rich, velvety sauce with a marvelous depth of flavor. This easy to make sauce is ready in no time and will take an ordinary steak or chicken breast to “Company’s coming for dinner” status in the blink of an eye. -In a large skillet over medium heat, melt the butter. Stir in red pepper flakes and mushrooms. Saute for about 3-4 minutes. -Add in the onion and garlic, stirring occasionally and cook for an additional 2-3 minutes. Reduce the heat to low and add in the flour, salt and pepper. Stir and cook for 1 minute. -Pour in the wine and the beef stock. Increase the heat to medium and stir frequently until the sauce thickens considerably. -Right before serving, stir in the rosemary and thyme. -Serve over steak, chicken or pork. How To Decoupage A Funkin Pumpkin! 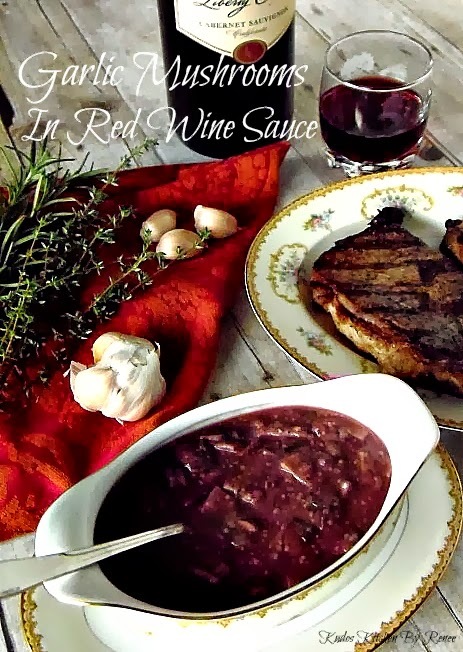 garlic, mushrooms and red wine and fresh herbs… I could eat just about anything with this sauce. Yum!! Red wine, Mushrooms and garlic – three of my favorite things 🙂 I must make this recipe stat! Wow! What a fantastic dish! My Husband would go bonkers for your sauce!! This looks so awesome. I can feed my family anything with garlic and it will be inhaled, thanks for the great recipe! Oh my goodness! This sounds amazing and just screams out for a nice thick juicy steak alongside!! There's a reason why garlic, red wine and mushrooms is a classic pairing with steaks. It looks delicious and thank you for participating this week. Mushrooms are my favorite. I love this recipe! Pinned. This sauce is right up my alley. I love mushrooms and a good red wine sauce. Yours looks delicious! I could probably eat that with a spoon! haha. Looks so good! What an awesome looking sauce, I love a red wine sauce like this!! There's a restaurant I go to where I always order a dish very similar to this: steak topped with a mushroom wine sauce. I LOVE it and I bet that I'd love your version even more.